Fertilizer producer Mosaic has reported a 79% drop in profit in the last quarter of 2013, reflective of the weakened phosphate and potash market. But following a year of significant pricing pressure and lower-than-expected sales volumes, Mosaic's board of directors has decided to approve a $1 billion share repurchase program, adding to a previously disclosed agreement to repurchase 43.3 million shares in the first half of 2014. The scheme appears to have cushioned the blow of low profits: Mosaic shares were up neary 2.5% on Tuesday, trading at $47.96 apiece. Net earnings for the year were $129 million compared with $616 million a year ago. Earnings per share were 30 cents compared with $1.44 in the same period the year before. "While our results for the fourth quarter reflect the low market prices for potash and phosphates, current market conditions are improving," said CEO Jim Prokopanko in a statement. "Market dynamics are unfolding as we expected they would, with sales volumes increasing before prices; in fact, we shipped a record volume of phosphates during the quarter, and potash volumes increased significantly. Full-year profits were down more than 40%, an indication of just how battered the potash market is after the collapse of the world's biggest potash pricing cartel last summer. Mosaic isn't alone: Last month Potash Corp. of Saskatchewan reported a 46% drop in fourth-quarter profit. The price collapse forced Mosaic and other potash producers to sell their product at a significant discount to last year's levels. In the last quarter of the year, Mosaic sold its potash for an average price of $303 per tonne, down from $435 a year ago. Mosaic sees an improving potash market looking forward and expects sales volumes for the first quarter to be higher than in 2012. 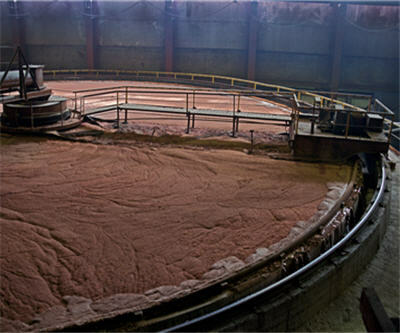 "Customers believe a bottom in potash prices has been reached and are now exhibiting improved confidence in their buying decisions," Prokopanko said. "In 2014, we expect record global shipments and improving producer operating rates. Our long-term constructive outlook for potash has not changed."